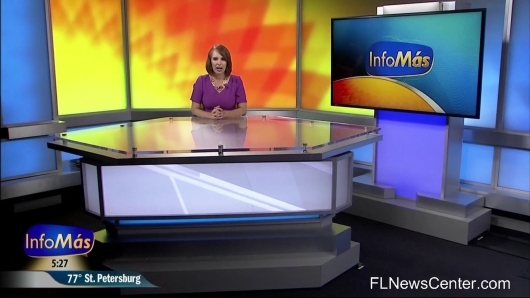 Bright House Networks‘ Florida-based Spanish language news channel InfoMás has debuted a new home that’s similar to that of sister channel Bay News 9 in Tampa, Fla. The new set, located in Studio B, matches the look and feel of its English language counterpart, including the LED soft video walls. Florida News Center reports the set will also serve as a backup for both Bay News 9 and News 13 (formerly Central Florida News 13) in Orlando, Fla. The two channels already share resources to produce InfoMás, which previously had two separate feeds distinct to each market. Given that, it’s likely that News 13’s new set will mirror the look and feel for these two sets when it debuts sometime in the future. The InfoMás version of the set is a bit smaller and also lacks the multi-panel video array found on its big sister’s set, though it does feature two large flatscreens used for OTS and standups.